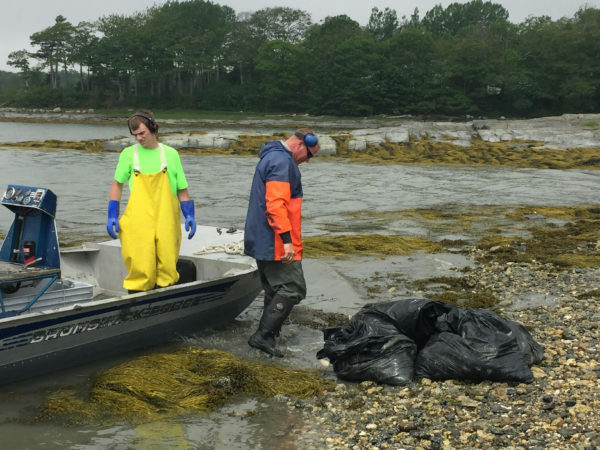 Brunswick Marine Resources Officer Dan Devereaux (right) and his son, Jesse Devereaux, unload bags of dead pogies at the Simpson's Point boat launch. 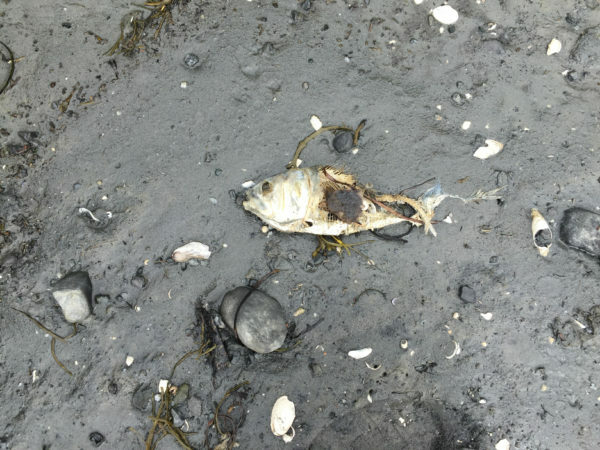 Thousands of dead pogies covered the Brunswick shoreline over the past week after a fisherman caught too many for his boat to carry and released the excess fish back into the water. One of tens of thousands of dead pogies that covered the Brunswick shoreline over the past week. Brunswick Marine Resources Officer Dan Devereaux (right) and his son, Jesse Devereaux, drag bags of rotting pogies from the flats in front of Rev. Frank Strasberger's home in Brunswick. 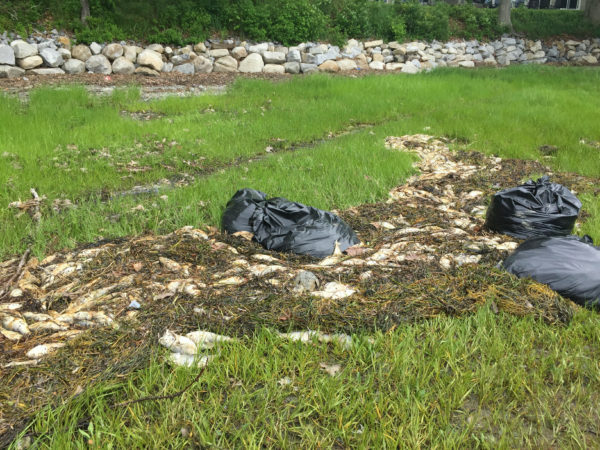 BRUNSWICK, Maine — A fisherman identified by the Maine Marine Patrol caught too many pogies in his purse seine last week to load onto his boat, and left the overflow floating in Maquoit and Middle bays. By mid-week, the “choking stench” of the rotting fish left waterfront owners with no choice but to close their windows and stay inside. The Rev. Frank Strasburger, who lives along the cove around Simpson’s Point, was frustrated long before an airboat pulled up on the mud in front of his house, delivering Brunswick Marine Resources Officer Dan Devereaux and his son, Jesse Devereaux. 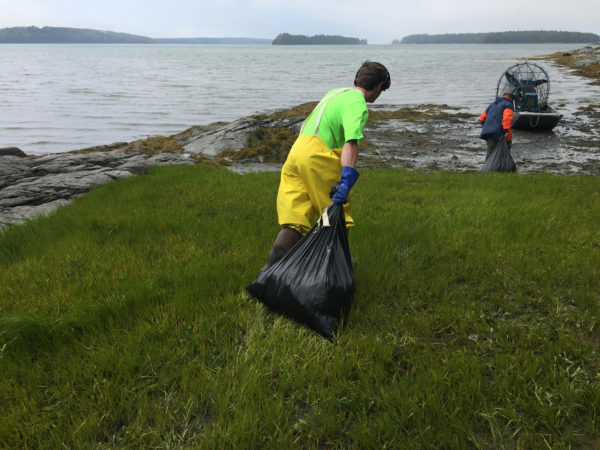 On Sunday, Devereaux and his son, along with local shellfishermen and a handful of Jesse’s friends, combed the shoreline between Simpson’s Point and Miller Point, filling trash bags with dead pogies, otherwise known as menhaden. On Monday, Devereaux and his son again traveled the shoreline in an airboat, retrieving the bags. Strasberger praised them, but said he was disappointed that state government hadn’t offered to help. But Maine Department of Marine Resources spokesman Jeff Nichols said later Monday that the Maine Marine Patrol had identified and spoken to the fisherman who was responsible for the kill, but he declined to release any identifying information. Nichols said Monday that the DMR had no plan to assist in the cleanup. During the past week, the pogies accumulated largely at the high-tide line along about five miles of Brunswick coastline. As they filled the tidal creeks, their rotting carcasses snagged in the grass and other areas where the wave energy isn’t as strong. And in the heat, they began to smell. Devereaux said his chief concerns are for the community and its resources. He referred to two memorable “fish kills” in the nearby New Meadows River in the late 1990s. In both cases, dissolved oxygen caused hundreds of pogies to die in the shallow estuary. But this time, Casco Baykeeper Ivy Frignoca has been monitoring the oxygen, Devereaux said, and the bay is healthy. Strasberger sent an email to other residents of the area, urging them to join him Monday night at a meeting of the town council in hopes of convincing the council to hire a company to clean-up the area, “press the state,” which has responsibility over pogy fishing, to “step up to its responsibility to this emergency,” and insist the state release the person’s name to hold them accountable for the fish kill. Strasburger said the “choking stench” has caused him and his wife to keep their windows closed for more than a week.